Version 2.0 of the Certified Against Piracy Guidelines combines several existing anti-piracy tools – including the TAG Anti-Piracy Pledge and the Core Criteria for Effective Digital Advertising Assurance – to create a consolidated and cohesive set of requirements for the Certified Against Piracy Program for the first time. It also provides a straightforward path to compliance for both direct buyers and direct sellers. All covered parties will now be required to be TAG members in good standing, have a designated TAG compliance officer, and attend annual anti-piracy training. 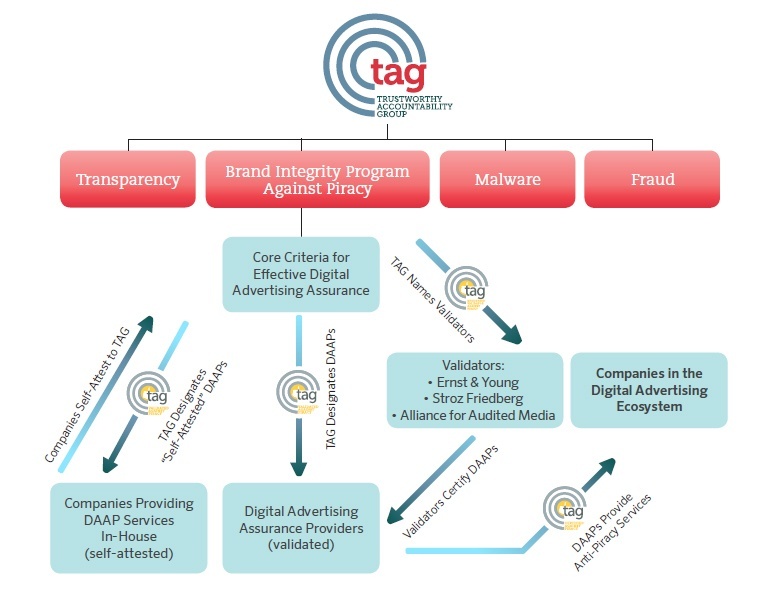 Direct Buyers will be required comply with and fully operationalize TAG’s Anti-Piracy Pledge, and employ pirate mobile app filtering for all advertising displayed in a mobile app environment. Digital Advertising Assurance Providers (DAAPs) will be required to employ pirate mobile app filtering for all advertising displayed in a mobile app environment and comply with at least one of the five Core Criteria for Effective Digital Advertising Assurance. Direct Sellers will be required to ensure their properties do not block nor unduly restrict or disrupt the use of anti-piracy software. Depending on the degree to which Direct Sellers host licensed and/or user-generated content (UGC), additional requirements may include attestations that a publisher owns or licenses the rights to all content on their properties or employs commercially available means to ensure that their properties do not host nor stream infringing content.